The Wand Company is proud to present our Star Trek: The Original Series Bluetooth Communicator. This exceptionally accurate and highly detailed working replica was revealed at San Diego Comic-Con in July 2015 and will now be shipping in June 2016. Our new Communicator is an advanced Bluetooth enabled speakerphone that is compatible with all Bluetooth enabled communications equipment worldwide, such as mobile phones and music players. This Original Series Bluetooth Communicator is not a toy: it is an advanced, Bluetooth wireless technology enabled communications device, designed to pair with a mobile phone and thus permit near instantaneous person-to-person communication at a considerable distance. When paired with a device capable of streaming music, the Communicator may also be used as a wireless music speaker. This Communicator has been developed to give its owner the maximum level of enjoyment; designed using extremely accurate 3D scans of one of the last remaining communicator hero props from the 1960's Original Series television show, dedicated attention to detail, the use of authentic materials, textures and finishes and the tireless support and extraordinarily deep knowledge of HeroComm.com so generously given to us, has resulted in a fully functioning, display grade product that is highly faithful to the original prop. The Communicator is robust enough to be used in play and cosplay. With its authentic sound effects and original voice clips, the Communicator provides plenty of opportunity for in-universe interaction and fun, and of course its Bluetooth functionality enables it to be used exactly as it was always intended – as a person-to-person communications device. The Communicator is not a walkie-talkie. In order to use it to talk to another person, you will also need a Bluetooth-enabled mobile phone (or internet phone) that can make and receive telephone calls. Pairing with a mobile phone is a simple procedure. 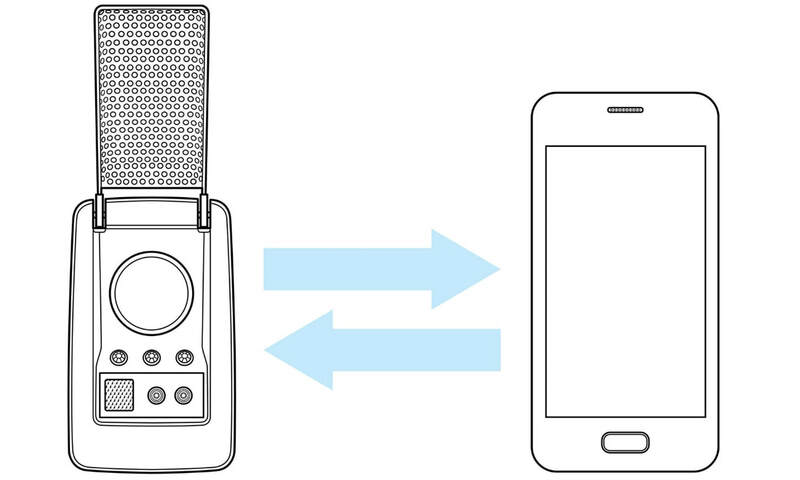 Once the Communicator is paired with a phone, just flip open the antenna grille to answer an incoming call. Press and hold the right-hand button to initiate voice dialing (or to access other functions available via voice-activated assistants such as Siri on iPhones, Google Now on Android or Cortana on Windows phones). Double-click the right-hand button to pause and play music. 20 authentic Star Trek voice clips and Communicator sound FX can be accessed at any time via the right-hand 5-way jog button. A Communicator that really works is a dream come true for fans who have waited 50 years for the function of this ionic prop to be realized. 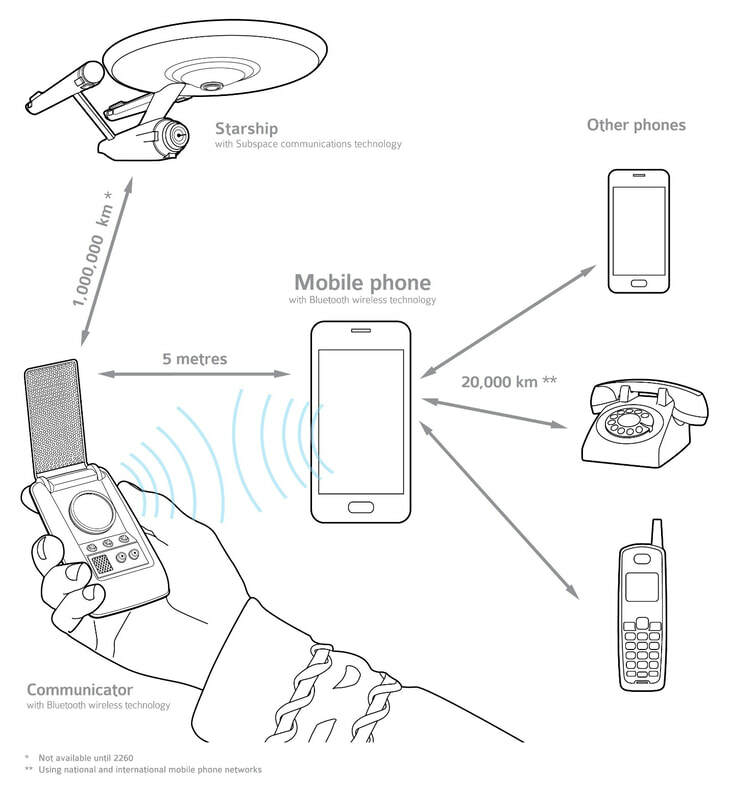 Ever since James Tiberius Kirk flipped that gold-colored antenna grille, called the Enterprise’s Chief Engineer orbiting 1000 kilometers above him, and asked to be beamed up, every Star Trek fan, in fact pretty much every science fiction fan, has wistfully dreamed of having a working Communicator of their own. The Communicator didn’t just excite fans with a sense of what the future might hold for them: it actually inspired engineers to boldly go and create that future. Martin Cooper, the engineer working at Motorola credited with creating the world’s first mobile phone in 1973, said it was Kirk’s iconic prop that inspired him to create it. The mobile phone has changed the way that the human race interacts. Mobile phones now dominate one-to-one and one-to-many communications; but still nothing can compare with the utter magic of putting yourself into the mindset of an intrepid 23rd century Starfleet landing party and flipping that golden antenna grille to answer an incoming call with the classic Communicator chirp, or speaking through the Communicator to your ship’s computer to ask it to dial and connect you with one of your friends. For all those fans that dreamed, now at last the wait is over – owning is believing!